Although it is late and over budget, the $621 million dollar Capitol Visitor Center is spectacular. The long-delayed center has finally opened and it is the largest-ever expansion to the U.S. Capitol. 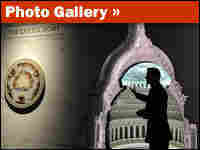 The U.S. Capitol Visitor Center formally opens to tourists Tuesday, over budget and behind schedule. At 580,000 square feet, it's the largest project in the Capitol's 215-year history. It was originally scheduled to open almost four years ago, and the $621 million price tag is double the initial estimate. The center will help keep the Capitol's 3 million annual visitors out of the elements while they wait for tours. Inside, they'll find a multitude of historic documents, artifacts and interactive computers. In addition, there's a 530-seat restaurant — and more than two-dozen restrooms. According to the center's Web site, the entire facility — approximately three-quarters the size of the Capitol itself — is located underground on the east side of the Capitol so as not to detract from the appearance of the Capitol grounds designed by Frederick Law Olmsted in 1874. The idea of the visitor center dates back to the 1970s, and Congress authorized funds for planning in 1991. But momentum for the project did not come until 1998, when a mentally unstable man burst through the doors of the Capitol, killing two police officers before being subdued in the office of Rep. Tom DeLay. That impressed on lawmakers the need to move security stations for visitors away from the main building. The groundbreaking ceremony took place in 2000.